CTG : Welcome to the Montreal Comiccon, I’ve been an admirer of your work since the early days of the Silver Surfer. Can you tell me how you first got started in comics? Was it a childhood fascination? JS : Yes my father worked at Chrysler’s, he worked in the drafting department and one of the benefits he had was, at the end of the day he would fill his briefcase full of tracing paper, number 2 pencils & masking tape that he could fit in there. He was gonna use them for his carpentry hobby, but I found that I could trace off the Curt Swan Supermans and started learning how to draw from there. CTG : When did you first realize “O.K I can make a living at this” ? And how did that make you feel? JS : I was in the service and was sending out drawings to Marvel & DC both and eventually Joe Orlando up at DC bought a two-page horror story I did, so that’s what convinced me that I could make a living at I immediately… after getting out of the service, packed up my bags and ran back to New York and started working ever since. CTG : Are you on Twitter? How do you think social media is affecting or influencing the comic book industry? JS : I’m not on Twitter, I’m on Facebook, but everything’s getting more digital and there isn’t going to be a day when people are going to do their comic book viewing digitally and if they want a hard copy, they’ll order a hard copy special on demand. That’s the way I sort of see things going. Twitter, I’m still not sure how long a life span it will have. CTG : There’s a rumour around the water cooler that you had something to do with the cancelling of Thanos : Son Of Titan? Can you shed some light on that? JS : No no no, the movie people decided to cancel that. CTG : So it had nothing to do with creative rights? CTG : Craziest fan moment? JS : Early on, three gentlemen came and asked me to autograph their books while I was standing in front of a urinal… doing my business. CTG : (laughing) That’s hilarious! CTG : You can’t wait two minutes fellas? CTG : Do you still revisit the LCS & read comics regularly? If the answer is yes, which are your current top 3 books? JS : The answer is no, because I have no comic book shops near me, the nearest one is about 25 miles away, which I occasionally come visit and I visit my in-laws who live in that area. 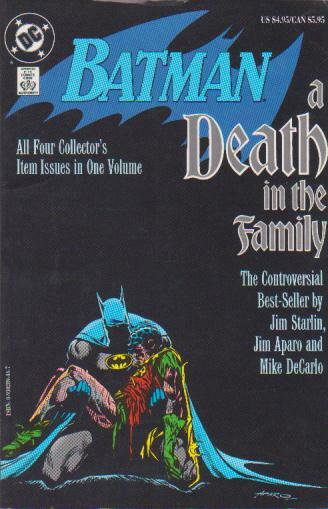 I don’t really read comic books regularly at this point, occasionally someone will say “check this out” and I will. 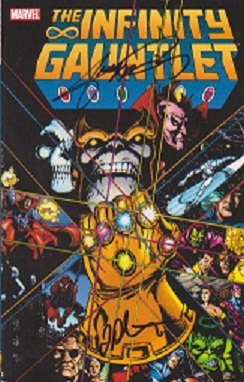 I suppose now I will have to go back and read all the Thanos stories that have happened since my time, other than that, I’m more into books without pictures these days actually. 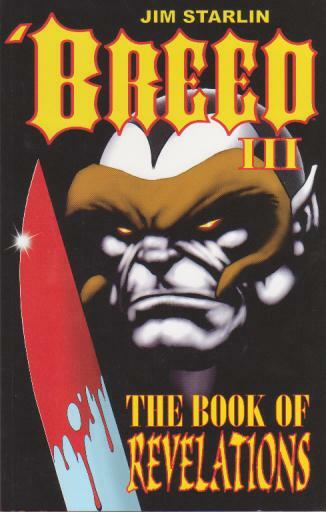 CTG : What was your inspiration for ‘Breed? Are you a big horror fan? JS : Let’s see, ‘Breed was a combination horror, Vietnam, lots of different things. He just sort of came out of a mixed bag of different things that were floating around in my head at that time. CTG : What piece of work you did, do you consider a disappointment? If you could go back, what would you change? JS : Disappointments, hhmm. The Death of The New Gods was a disappointment, it was a nightmare throughout the end of the science fiction run I did on Strange Tales, it was very disappointing after Mystery In Space & the Rann-Thanagar War which had worked out so well. I did a thing called Unity with Jim Shooter, even though we finished the job, it never saw print and that’s kind of a disappointment and that’s the only time that’s ever happened to me. 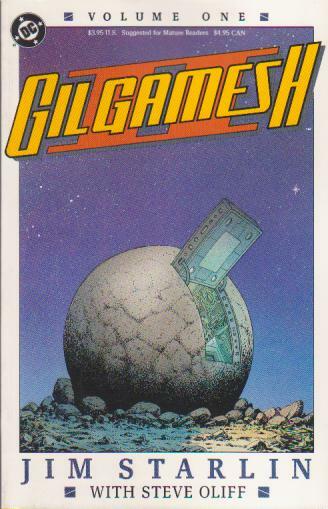 CTG : Jim Shooter, there’s a name I haven’t heard in a while. What’s he up to? JS : I have no idea, I haven’t really ran into him since those Unity days. I usually see him at conventions, but I haven’t had much contact of late. CTG : Which creator whom you haven’t worked with would be a dream collaboration for you? What type of story would you ideally like to do with this person? JS : I’d like to work with José Luiz Garcia-Lopez and we are actually talking about doing a science fiction thing, which is what I’d want to do with him, because I love his science fiction work and we’re talking to DC about that. CTG : That was actually my next question. Besides that project with Garcia-Lopez, what are you currently working on? Or in the near future? JS : I’m currently working on two illustrated novels that I don’t have publication dates or publishers for, I’m gonna piggy back on some other publicity down the line. They’re called Last Good Boys & Mind Games, those are the things I’ve been illustrating and I’m talking to Marvel & DC now about writing some different stories for them. CTG : How do you feel about Marvel & DC rebooting their titles? JS : Comics are pop culture items, they have a shelf life like any pop culture items, I can see the rebooting because every generation sort of gets their new character, I mean, when I was young we got the new Flash, the new Green Lantern revamped from the 1940’s versions, so this is nothing new actually, it happens a bit more often then it used to, but you know as long as you stay of what the core of somebody like Superman or Batman are like that I think you’re ok. When you go too far off field on something that is working, I find that kind of disturbing, but most times they don’t do that. It’s just part of the business. CTG : Well this is has been a real honour for me, thanks for the interview and enjoy the rest of Comiccon. JS : All right. Have a good one yourself. What a nice guy and the interview went smoothly. Just to let you know how much of a nice guy he was, when I first approached his table there were no fans (what’s up with that? ), so he greeted me and signed a few of my comics. Then I asked him for a 5 minute interview. At this point there were already a few people waiting patiently behind me, so he said it was too busy for now and to come back at 2:00 PM and we could go outside where it’s quieter and I could conduct the interview there without noisy distractions. Got back at 2, he remembered me, closed his booth for a 90 minute break and off we went. Kept his word and proceeded with the interview you see before you. Now that’s class. 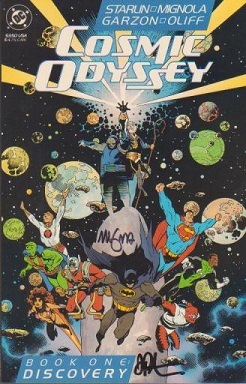 FYI The Infinity Gauntlet was also autographed by George Perez & Cosmic Odyssey #1 was also autographed by Mike Mignola. Hell yeah!